It seems like only yesterday that I reviewed the last Ten album, Albion. It wasn't yesterday, but it was only six months ago. 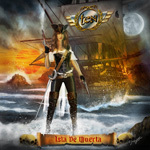 Now Ten returns with Isla De Muerta, their twelfth album in their long career.Once more, band mastermind Gary Hughes and cohorts deliver an album of AOR melodic hard rock swerving, at times, into melodic metal. I could refer you to my review of Albion and we'd be done here. If you're familiar with Ten, then nothing really changes. Catchy songs with great melody and harmony, triple guitar harmony to boot. And, of course, the guitars deliver an abundance of tasty leads. Hooks in both lyrics, usually the refrain, and arrangements are abundant. There's the usual synth embellishment to add both atmosphere and depth. 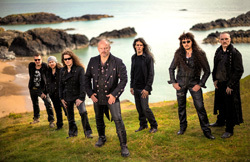 The rhythm section sways between essential hard rock groove and steadiness and some near power metal bombastic flair. In the midst of all this is Hughes' smooth melodic vocals. Add this all up and it's the perfect Ten storm. Is there more to say? If you're a fan of the band and their music, then not really. Get the album and you'll be pleased. Alternatively, I don't think Isla De Muerta is as strong as the former album. The opening instrumental Buccaneers and the following Dead Men Tell No Tales, even after several spins, didn't pull me in. It took what followed to get me into the Ten groove. Tell Me What To Do sets the hook with it's groove and melody. This Love is large sweeping ballad, both emotional and catchy. The Dragon and Saint George and the longer Karnak/The Valley of the Kings offer melodic metal rock with lots of guitar savvy. In between, however, is Intensify, which sounds the same from beginning to end, excepting the guitar lead in the later quarter. Later, there's quick paced Angel Of Darkness, catchy and has a bit of old school Hammond at the start. The album concludes with another ballad, with Hughes and piano in the first half, leading to bristling riffs and a large guitar solo, only to end as it started. Once more, Isla De Muerta is essentially straightforward Ten: everything you expect and love, nothing that you don't. Easily recommended. Once more, Isla De Muerta is essentially straightforward Ten: everything you expect and love, nothing that you don't. Easily recommended.